Only dirty, cluttered homes get bed bugs. False. Anyone can get bed bugs. Bed bugs have been found in the homes of the wealthy and poor. Unsanitary conditions will not cause bed bugs but getting rid of clutter will help to reduce the number of places bed bugs can live and hide. False. Bed bugs are small but can be seen with the naked eye. A magnifying glass will help. Young bed bugs are about the size of a poppy seed and mature ones are about the size of an apple seed. If I see bite marks I have bed bugs. False. Other insect bites may resemble that of bed bugs. 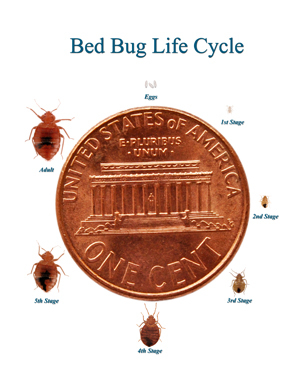 Presence of live bed bugs or their eggs will confirm their infestation in an area. If you have bed bugs you need to get rid of infested clothing and furniture. False. Clothing can be laundered to get rid of bed bugs. In most cases furniture can be treated and should only be discarded if there are no acceptable treatments that can rid them of bed bugs. Bed bugs are not known to cause or spread diseases. True. Bed bugs have not been shown to cause or spread diseases. Some people will react to bed bugs bites and excessive scratching can lead to secondary infections. Bed bugs cannot fly and will not jump from the floor to the bed. True. Bed bugs have no wings and cannot fly, jump or hop. False. Although they are called bed bugs they are not only confined to the bed. Bed bugs are commonly found in beds, on sofas, in chairs and areas near where people sleep or lounge. Some people are not affected by bed bugs. True. Some people do not have a reaction to bed bug bites and may be unaware that bed bugs are in their home until they actually see them. Bed bugs can live for many months without feeding. True. Bed bugs can live for many months without feeding. False. Bed bug scent dogs can be helpful, but are rarely necessary. Some bed bug scent dogs can signal the presence of a bed bug even when there is none, and may even miss some, with results varying according to the training the dog receives, the experience of the handler, and other factors. False. Encasements will help prevent a mattress or box spring from becoming infested or being a reservoir for bed bugs, but bed bugs can still find their way onto a bed to bite. And if bed bugs cannot live in a mattress or box springs, they will live somewhere else. Encasements are a good tool, but are not sufficient to prevent or treat an infestation. True. Pesticides registered with the Environmental Protection Agency do have to have data to back their claims. But products without pesticides, or with pesticides that are exempt from registration requirements may make exaggerated claims without proof. Use common sense. If it sounds like a miracle product, it probably isn’t. Insect foggers provide very little control of bed bugs and may even cause the bed bug population to disperse, making control more difficult. True. Insect foggers do not effectively control bed bugs. Insect foggers are dangerous in that they can leave unwanted residue throughout the treated area. Most insect foggers contain a flammable propellant and some have been associated with a number of fires.